Digital marketing separates itself from traditional marketing efforts by being able to track the customer through the entire online purchasing process, allowing you to measure the impact of your ads. However, if you are advertising online for a business where your users can only become customers through an in-person visit, it can be much more difficult to know how effective your ads are. 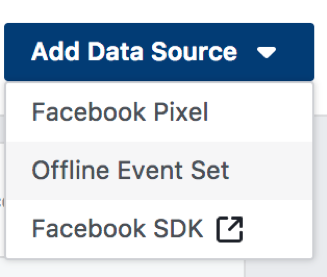 Luckily, you can now upload your offline conversion data to Facebook to see how many ad viewers end up becoming customers. This guide will walk you through the process for uploading that offline conversion data. To upload offline conversions to Facebook, you’ll need a Facebook Business Manager account with admin permissions on the account for which you’re uploading the conversions, and your offline purchase information will have to be formatted into a .csv data file. From your Business Manager page, navigate to the ‘Offline Events’ page, which can be found under the ‘Measure & Report’ section of the menu. Once on this page, click ‘Add Data Source’ and select ‘Offline Event Set.’ This can be found on the top-right corner of the page. Name the event set and link it to the appropriate ad account. Note that Offline Event Sets live at the Business Manager level, rather than within a specific Ad Account. So, if you will be sharing the responsibility of uploading the offline data with any co-workers, clients, or agency teammates, you’ll need to add these other individuals as Event Set admins in this step. This will allow these other users to upload data for the Event Set. You can also assign these permissions later from within the ‘Business Settings’ section of Business Manager. Once created, you will be directed to your new Event Set’s dashboard. In order to upload your spreadsheet, click ‘Upload Offline Events,’ which is, again, located in the top-right corner of the page. You’ll want to double-check your data mapping to make sure your columns are being imported correctly. To ensure your data will be understood correctly by Facebook, refer to this guide for data formatting. You should add as much data about your customers as possible, as this will improve Facebook’s chances of being able to match the customers to their Facebook profiles. Once uploaded, Facebook will give you a “match rate,” which is the percentage of customers Facebook is able to match from your upload to Facebook profiles. After the file has been uploaded and mapped, you’ll want to add offline conversion columns when reviewing your ad performance within Ad Manager. 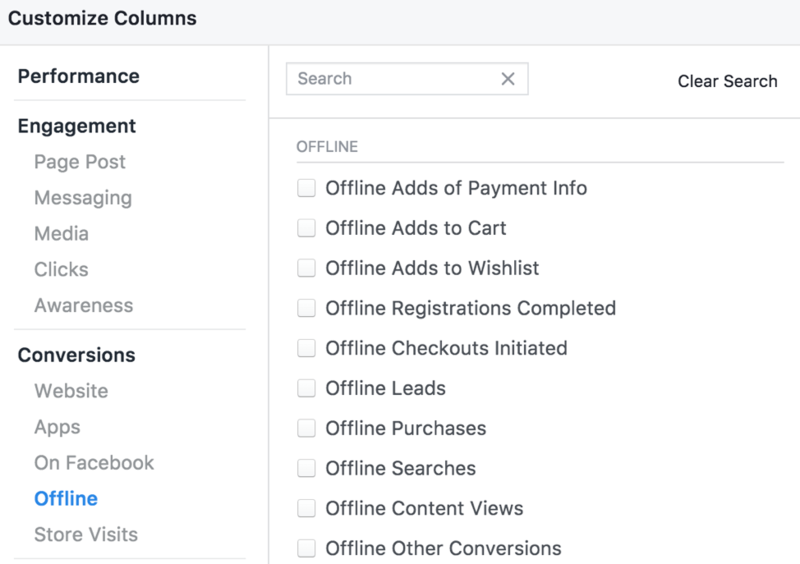 This is where you’ll actually be able to see the impact your ads are having on your offline conversions, as Facebook will attribute the offline sales to ads shown to the customers from your offline event set. If a customer’s Facebook account was shown your ad, that ad will have offline sales data added to the performance data within Ads Manager. That’s all there is to it! Using this offline conversion data should lead to better ad optimization, as you are able to prioritize the ads which most often lead to actual sales, as opposed to more directional statistics, like ad engagement and lead form fills. 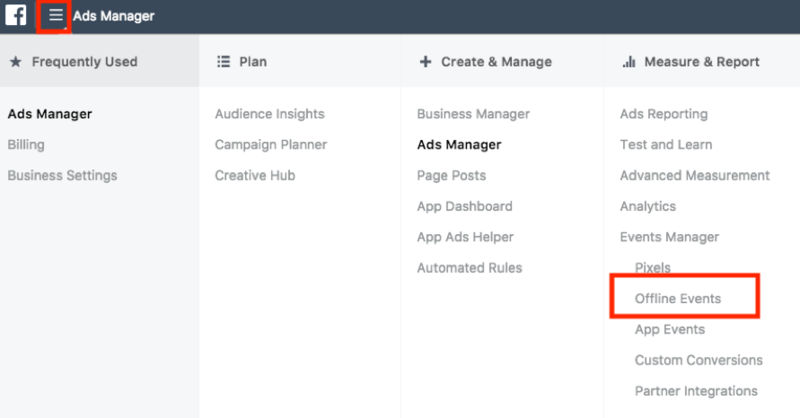 For a more advanced method of offline conversion tracking setup, you can also connect your CRM system to Facebook’s API, which will allow you to upload your offline conversions on a regular schedule without having to manually post the data each time. More information on connecting to the Facebook API can be found here. Have any questions or comments? Leave them below or Tweet to us at @WorkshopMktg.